I've been to a lot of weddings where they had disposable cameras on the tables. And, usually, they just sit there. I mean, everyone has their own cameras, iPhones, photographic memories. No one wants to pick up your antiquated disposable camera and take photos for you. You hired a photographer. Leave it up to them. Except, well, I wanted people to pick up those disposable cameras and take photos for me. I thought it would be amazing -- and sure, a throwback to 1994, but that was a great year. I was thrilled that the Rangers won the Stanley Cup and the World Cup was going on that summer. Both things that I distinctly remembering happening in 1994 but did not watch one single minute of. Strange the things we remember. For the things we don't remember, we capture them on film. See, you need people to take photos at my wedding, so invite James Bond*. Or, well, your guests in the form of James Bond. Create an "I Spy" card. You display a card at each table or at the welcome table, along with disposable cameras, and ask your guests to capture the moments listed on the card, like the groom playing with his ring; the bride and her mom dancing; the cutest couple other than the bride and groom; the worst dancer in action. We didn't hire a photographer for our rehearsal dinner or engagement party. Most people don't. You have to cut corners somewhere. Plus, you're going to be mingling, so you're not going to be able to take photos all night. Getting disposable cameras for each table and printing an "I Spy" card is pretty much the only way you can assure you get photos. Just right click the image above, save it to your computer, and print it on an 8.5x11 sheet of paper (a standard printer page). Display it in an 8.5x11 frame and you're done. 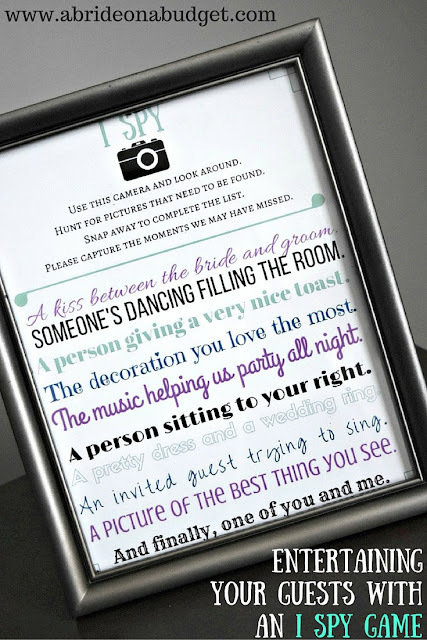 BRIDAL BABBLE: What would you add to your "I Spy" card? *Oh, are you coming from up top looking for why there was a star next to James Bond's name? Well, it's because apparently, he's not a spy. He's a secret agent. I thought he was a spy, but someone corrected me. I have seen exactly zero minutes of any James Bond movie, which is exactly the same amount of viewing I spent on sports in 1994. Full circle. Hunt for the pictures that need to be found! Find the moments the photographer may have missed. My email is mverdi@gamewood.net. If you want a template feel free to email me! Okay, so the 'I Spy' card is a wonderful idea. As a previous wedding coordinator, I can tell you that the reason why the cameras are (were) typically NOT used was because guests at the table felt funny or uncomfortable 'taking charge' of the camera. Here's what you do - you give them permission by either 1) putting the 'I Spy' card under someone's plate/napkin, etc, OR you put a small cut-out heart next to (or at) someone's place setting. That is the person who is the designated photographer for the table, and they won't feel as if they're stepping on toes if they take charge. After doing 100's of weddings - trust me on this! And yes - you can get the cameras fairly inexpensively on eBay. And on your 'I Spy' Card, make sure to leave instructions as to WHERE they are to leave the camera before leaving the reception. Alternatively - instead of leaving the cameras on each table, have them in a big basket next to the guest book for whatever guest who would like to nominate themselves as a photographer. It doesn't matter if two people at the same table have cameras since they will have their 'I Spy' assignments anyway. this really appealed to my romantic side, I thought about it in my sleep LOL! Plus I love supporting your endeavors. The groom spitting out food ha! Men are picky eaters ROFL!! Any guest double dipping in the dip AAArrrrgghhh!! I don't have an original idea for the pictures but I did look around the site http://www.ecamerafilms.com/Disposable_Cameras_s/3.htm and it looks like you can get affordable cameras. I looked around and they even have bridal ones. Can I second the idea of having a few cameras for anyone that wants to pick one up can. I know if I were getting married again I would make sure my niece had a disposable camera. and you can still buy the cameras at walgreens and cvs i know. The ring bearer getting a kiss (from bride or someone else)! Precious moments between the bridal party are to be cherished! bandpo1211(at) gmail.com I'm sure you can get the cameras with a wedding theme from Oriental Trading or other bridal distributors. Google would give you ideas! I Spy Little kids dancing together, the cutest kid, or a little kid trying to remove their outfit. I think they might still sell disposable cameras at CVS. Ohh I totally loved the new version of I spy game! This idea is totally rocking and no room for boredom. 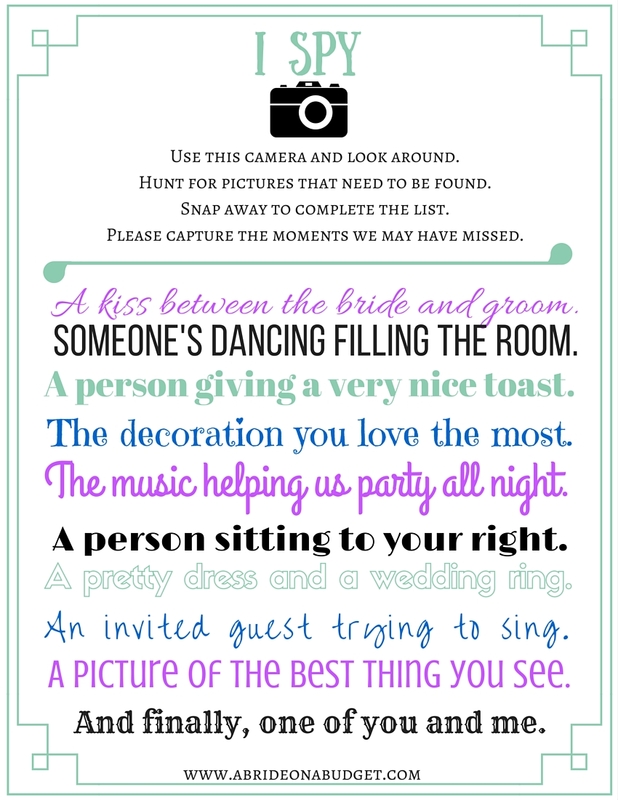 I love this idea for a wedding version of the I Spy Game. 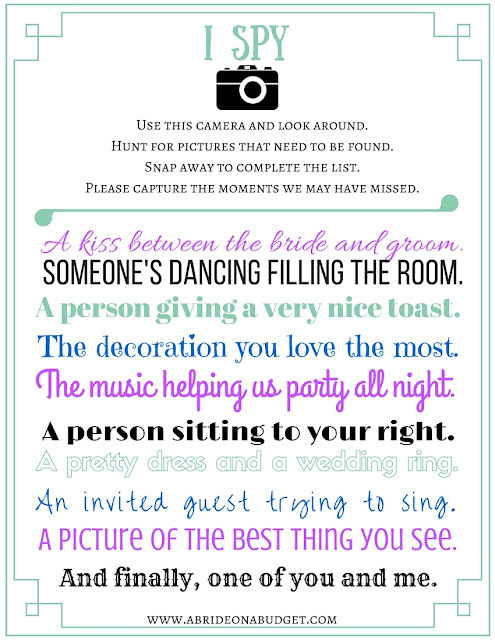 What a great way to get candid photos from your wedding! James Bond definitely knows how to hack someones phone! What a great idea. I love what you put on the list! Thank you for sharing at Celebrate It! I love this idea. It's a great way to get guests involved and the photos you want. Thanks for sharing on Sunday's Best. I'd ad A Dance between the Groom and a Child. Those always make the best pictures and videos. Thanks for sharing with us at Merry Monday. Such a fun Wedding idea! Pinning.